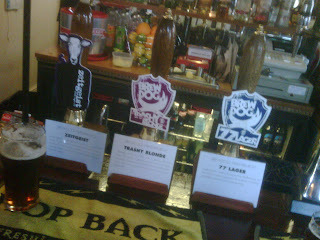 Just a quick report back from the BrewDog BBQ at The Bull at Horton Kirby. I started with a pint of Punk for a number of reasons. One, I find the alliteration and the way that ‘Pint of Punk’ rolls of the tongue completely irresistible. Two, I was in the mood for a big hop smack around the face. Three, I just bloody love the stuff. The pint was spot on; big hops, all that fruitiness – lycees, strawberries, a tropical fruit basket - and a bold gold body of malt. Next I went for 5am Saint. It’s a new BrewDog beer for me (tick…). The premise is high hop flavour and low hop bitterness all wrapped up in a red ale. This really was something remarkable: all the hop aroma and flavour is right there in the first mouthful but then you don’t get the bitter bite you expect, which is a little unnerving for the first few sips (kind of like getting kicked in the balls without the stomach-churning pain) but it seriously grows on you into this bottomless bucket of flavours. 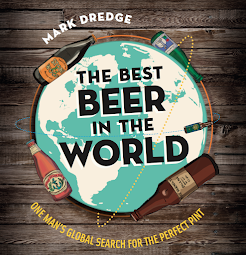 It’s one of those beers that tastes different with each gulp – strawberries, tropical fruits, caramel, bitter oranges, tobacco – and the hop bitterness is there in a tickle-your-tongue kind of way. This was a fascinating, brilliant beer. Then I went for a pint of Zeitgeist which, speeding past Punk and 5am Saint, was the best beer of the night for me. Full-bodied and smooth, roasty, chocolatey and then this swathe of fresh hops through at the end. It’s not a lager as you or I know it but that doesn’t matter one bit when it tastes this good. I chugged it back super-fast and then went back to the bar, faced with Punk, 5am Saint and 77 Lager (Trashy Blonde had been drunk dry by this point) and I went for another Zeitgeist. 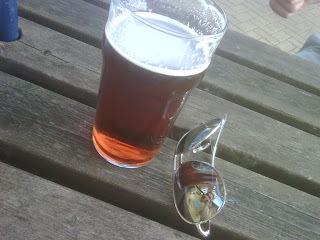 Knowing how much of a hop-freak I am, me choosing to have another pint of Zeitgeist says it all, I think. There was also some great food out too; sausages, burgers, jerk chicken, mackerel… perfect food to soak up the beer. And with 77 and Zeitgeist on the bar, a BBQ was the perfect food to put out, as this glorious piece here explains. BrewDog BBQ done but don’t forget the West Kent Pub of the Year party this Thursday, August 20th. Garrett is promising awesome and he is certain to deliver. He hasn’t given away any clues so I’m like a kid waiting to unwrap a present on Christmas Day. If you fancy some excellent beers on Thirsty Thursday then get on out there, it’s one not to miss (the details are here, on their facebook page). The picture is crap as it is from my phone. I did take some shots from my camera but I left it in Lauren’s bag. I’ll try and get something better up soon. In the meantime enjoy the 5am Saint in the top picture with the reflection of Brad/Dubbel in my sunglasses. And tune in every day this week as I attempt a Fantasy Pub Week following on from Friday’s If you had to… to try and create our dream drinking place. Zeitgeist was my beer of the night too. So, so good. 5am Saint left me cold I'm afraid, the smell and initial taste were good but without the bitterness to back up those hops it felt hollow and empty for me somehow. Garret gave some super mysical clues about what will be on on Thursday. When I pushed him for a list his reply was 'be here, there are some real scoops to be had!' He then cackled in that irrepressable laugh of his. Looks like the Saint is going to be a beer that divides opinion. I was looking forward to trying it and it didn't disappoint. Yep, Garrett was being a real tease about the line-up for Thursday, wasn't he?. Dark Star, Marble, Pictish, plus something really special that he couldn't tell me about, was all I got out of him. I suppose I'll just have to turn up and find out. Tough life, eh? Moggy, you gotta move dahn sarf to get the good stuff mate :) Although it's only The Bull that I find cask BrewDog in other than The Rake. Pete, ah Garrett's irrepresable laugh... he knows awesome things that we don't!! As long as Marble Pint is there I'll be happy. AndrewS, I enjoyed the 5am Saint too and I want more of it! If Darkstar, Marble and Pictish are there on Thursday then it's a good start, but what's the special one?! I'll definitely be there to find out and I'll hopefully see you there. I liked 5AM Saint in bottle. I tried Chaos Theory after for the first time - even better. I love the Brewpups and let me make it perfectly clear, that I'd drink gallons of their offerings at that festival if I had attended. Love the glass too, Liam. TTBC! I loved the comparison with the tropical fruit basket!